The best way to enjoy the summers is to take those cold baths, outdoor showers and also to dive into the swimming pools! We just feel awesome while being in water in summers it cause our bodies feel comfortable in deadly hot summer days! So what are your plans to get over enjoyed this summer? 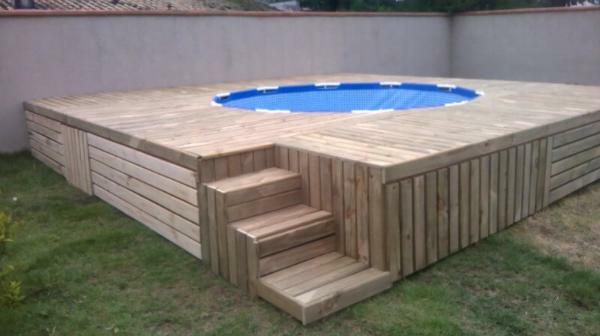 How it would make you feel if having your own swimming pool at outdoor? 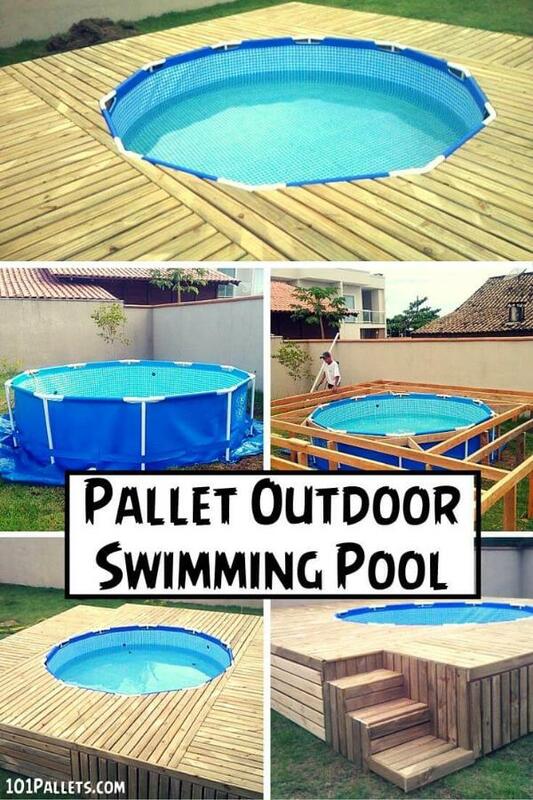 But this is all possible now you can even do it in a budget-friendly way using some free pallets! This is how you can take some real pallet ideas which are available always as free wooden skids and can be grabbed in abundances from any nearby sources like food stores, shipping areas, nurseries, scrap piles, dumping grounds and landfill areas! 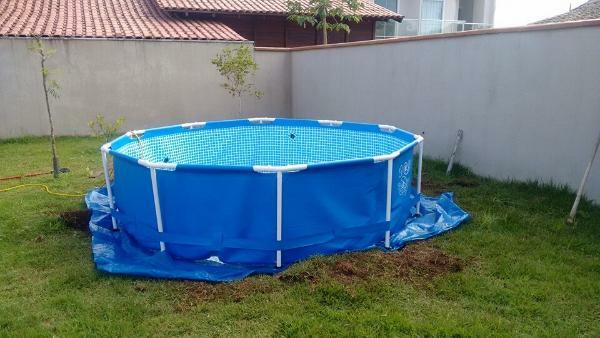 Grab a market version of a swimming pool first which is mostly made of water proof plastic fabric! One, having a circular shape has been grabbed here made of blue plastic fabric! The interior also looks graceful in light blue! 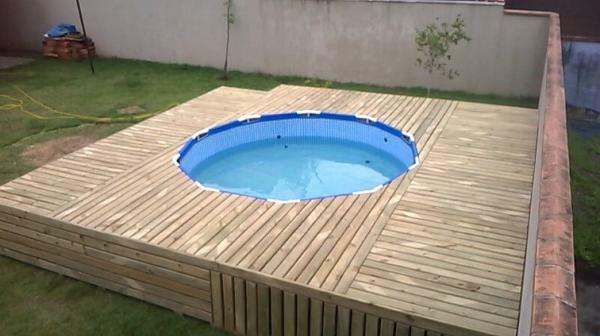 A raised wooden deck with a swimming pool inlay is the target here so the at very first, the primary work may look like this! Here you really need to work with care and also need to use a little bit creative engineering! Starting from the mid, the square frames have been built that gradually becomes bigger while coming in outward direction! 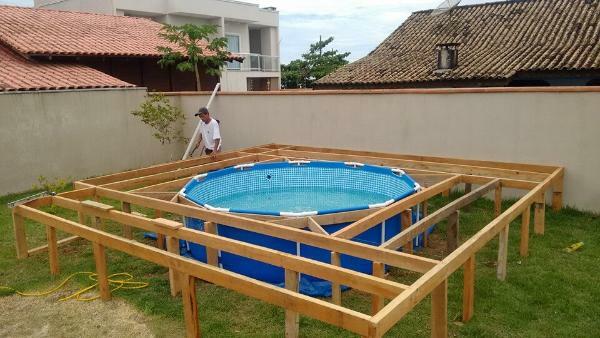 After fixing the pool in the whole primary base has been given an external solid flooring, a lot of pallets slats have been used to do this so dismantling of a big pallet pile is must to do this project! Pallets slats have been aligned differently just for some patterned and stimulating top surfaces! 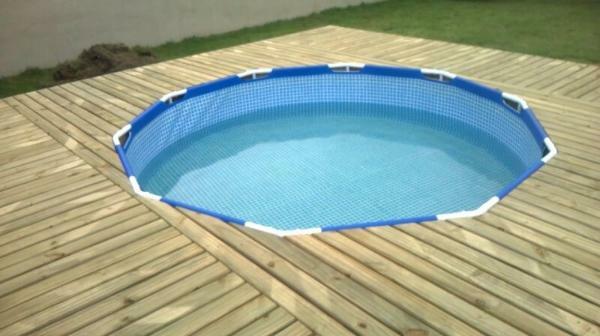 This raised wooden deck would also a praiseworthy if selected for a daytime sitting! At one corner, 3 beautiful steps have been installed that refers to a beautiful wooden stair, would be all convenient to reach poolside deck area with elegant walk!